BIRTHday Breakfast Club is a very long standing tradition between a group of friends that goes back many, many years. We usually meet at a variety of places downtown to celebrate our birthdays throughout the year, but this time I decided to host it. Just fun to mix it up a bit. Plus we tend to linger longer, talk more and laugh even more, if that is even possible, when not at a restaurant. 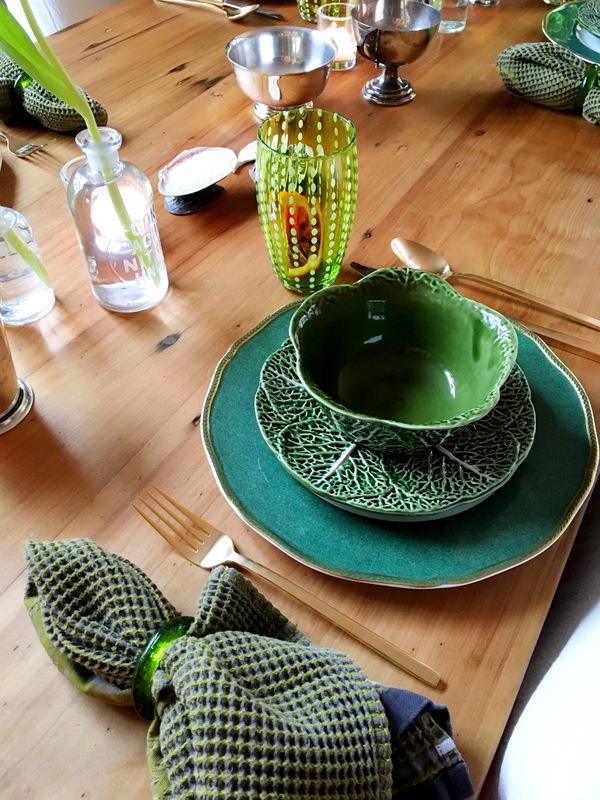 Green was the main color choice for the table, all starting with new green glasses with white markings we just started carrying at the shop, that I was longing to put into action. Pale creamy tulips that I picked up at Met Market (which is one of my favorite grocery stores of all time) looked the swellest and I had to run in to get a Poilâne half miche which was also central to the table & meal. 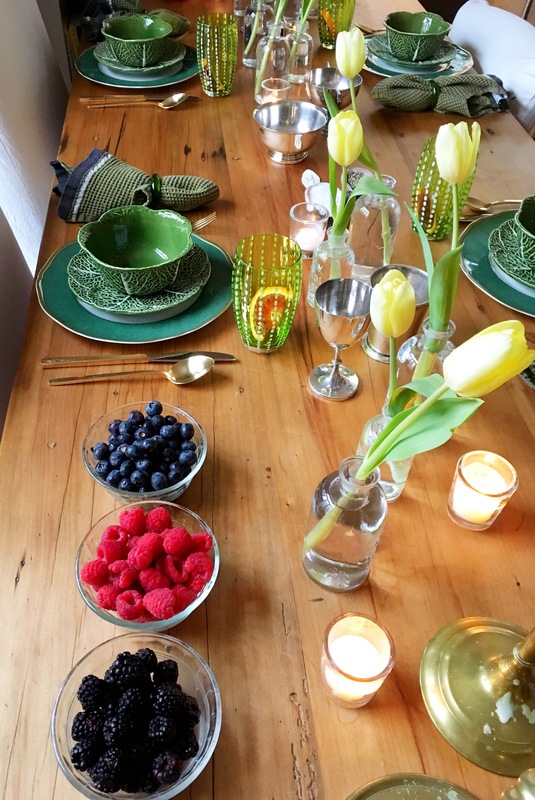 Green leafy cabbage bowls and green ribbed plates were in the mix, as well as vintage silver trophies down the middle of the table. Add a few votives and light all the taper candles and we were off. Even though it was morning and light outside, I still like lighting candles. They add a specialness to the meal, always. 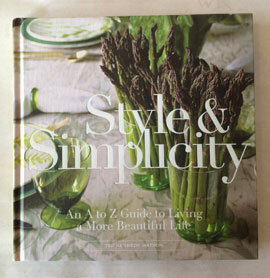 When folks chat with me at the shops about a blog post, they often ask “What was served?” when I write about a table setting. We started the birthday celebration off with a toast, of course. I put a slice of blood orange in the new glasses and then filled it with a combo of fresh squeezed orange juice topped with Veuve Clicquot. We started with fruit, yogurt and granola while we chatted away. Then I made an herbed chèvre frittata with sautéed mushrooms, alongside roasted potatoes, and super peppery bacon. The Poilâne bread we had with the meal with French butter and then had it with INNA Jam as a little dessert. By the time we finished, it could have also been considered brunch, as I did not eat again until dinner that eve. 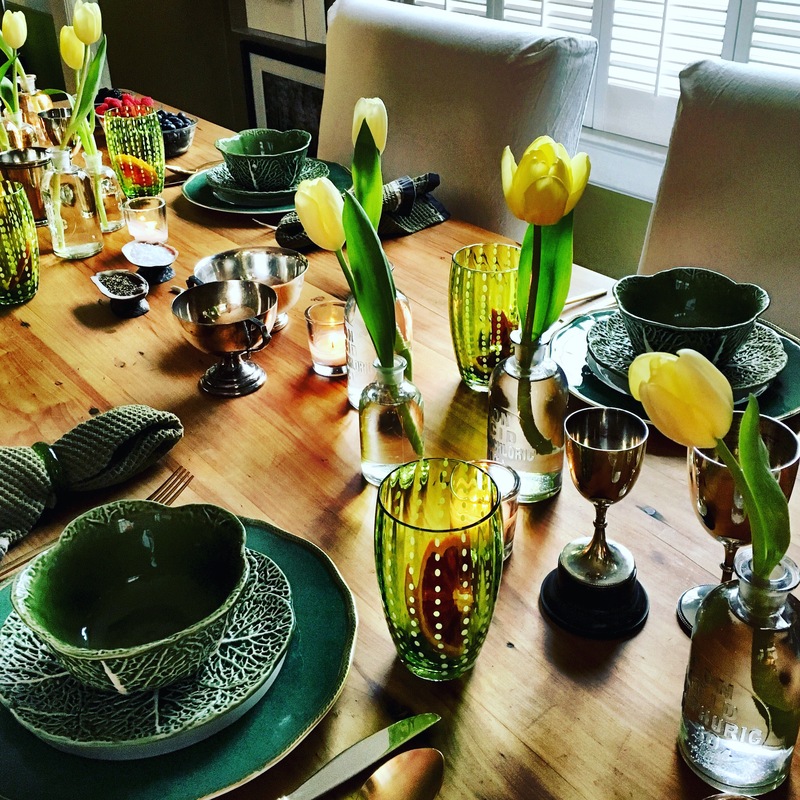 Really just hard to beat sitting at home at your dining table sharing a meal with friends.